Hey guys. I found this outline for a post while clearing out my computer, and wanted to share it as yet another example of how I string ideas together. It's unfinished and very raw, but while rereading it, it was interesting to try to figure out my thought process while I was in the act of throwing words to the page. 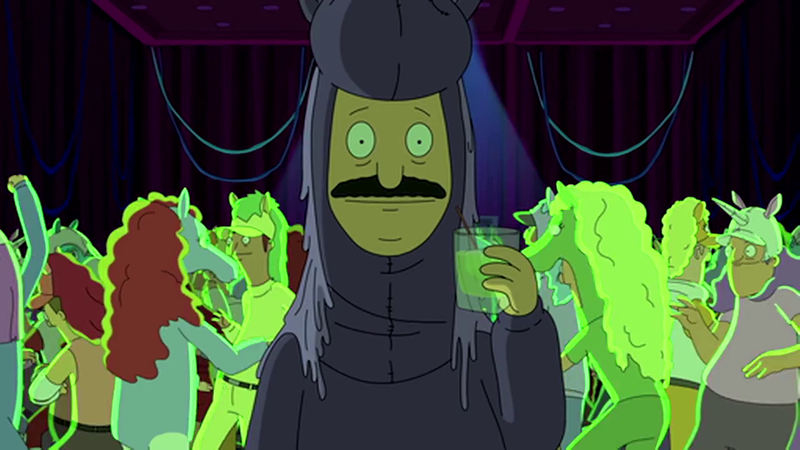 It was supposed to be an examination of the Equestranauts episode of Bob's Burgers from earlier this year, and how it both lampoon con culture, but also fits into it, highlighting an awareness of the fandom and meta-fandom on the minds of the writers of the show. I don't think it fit that intent very well. But at the same time, as a purely theoretical exercise, it's worth revisiting. And, to be honest, clearing off my open windows that should have been closed ages ago. A few years ago I wrote a piece on the idea of stereotyping fandom communities. And we all know the dangers, and the realities, associated with the “popular image of fans.” In that essay, I looked a bit at how media portrays the fan, how they magnify the eccentricities of certain fans, and how fringe culture within fandom is frequently portrayed as the norm. When I wrote that piece, I was drawing on my fieldwork at the time, and had been slowly absorbing a good deal of fandom perceptions that rubbed me the wrong way- misconceptions about who fans were and how they practiced their fandom, and why mainstream culture would likely never understand the true dimensions of participatory culture. One of the areas that has benefitted much from this newfound interest has been “meta-fandom,” and the self-referential nature of fandom events. Long-running fandom series often develop these tendencies through episodes and interactions between the characters and the audience, which becomes drawn into the narrative at large and acknowledged for its existence and participation. Supernatural, that never-ending trip through Americana and hot boys, is particularly guilty of incorporating the meta-fandom awareness: no fewer than three episodes have been devoted to the fans and their world, and in each case the fandom has actually become an accepted character within the story. For the most part, the series has been sympathetic to the portrayal of fans, making note of its quirky practices, but also being very accepting of its community and the comfort it provides for those who ascribe to it. 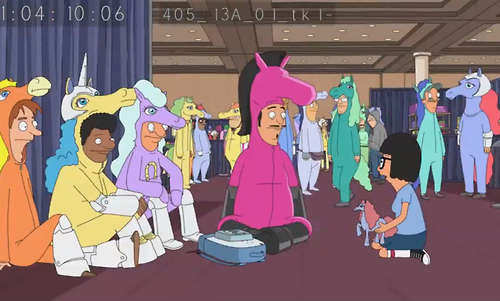 And then came Equestranauts, Bob’s Burgers foray into the same world of conventions and fringe fandom ideas that other series have taken before. But unlike the playful undertones of “The Real Ghostbusters,” which kept the action relevant to the world in which it existed, the writer of Bob’s Burgers decided to approach it with the same slant they approach everything- they ripped it apart, effectively skewering both fandom and the outside perception of it. Part of the true genius behind The Equestranauts is that it treads a very fine line between satire and savagery. The writers of the show are very aware of the power of fans, and the nature of fandom itself. They know their viewers will identify the specific fandom (and associated cultures) they are placing on display, and are also aware that some of them will definitely be offended. Of course, that does not stop them from diving in with both feet, throwing the emotionally vulnerable Tina into a shark tank full of eccentrics that even she has initial trouble relating to. The fears associated with the attending of one’s first convention are plain on Tina’s face from the moment she walks in- excitement at finally getting a chance to interact with one’s “peers,” the wonder at the size and scale of the event, the shock at encountering both vendor prices, and fellow attendees’ absurd outfits and behaviors- these are all part of the convention experience. We have all felt this, regardless of how much we want to downplay things. And we all made those same snap judgements over the course of the weekend, often without stopping to take everything in. For Tina Belcher, this experience is condensed into overpriced goods (a hand-stitched saddle that sells for “as much as a real one”) and the sudden realization that she is among a group of adult men. “This isn’t a community of my peers,” she says, expressing the fear of finding ones-self among an unintended demographic. Enter the first stab at the nature of fandom, wrapped up in the trappings of a girl’s show about ponies, the Equestranauts. Fandom conventions are about escape: the ability to leave the world behind for a time an engage in both the fantasy of a world that does not exist, and a chance to celebrate an ascribed identity rooted around shared love of a cultural artifact. Within the sacred space of the convention center, fans are safe to be who they wish to be, and practice their fandoms free of judgement from those around them. Tina, who until now has been a fan in the privacy of her own home, was excited to attend the event because it gave her a chance to break out of her personal sphere and engage with the fantasy, if only for a day. Highlighting both the best aspects of con culture, and the worst, my major concern here is that it will reinforce the stereotype of the people who attend “fringe fandom” events- unlike massive pop culture cons like SDCC, the “fringe” element is still attached to events like Bronycon and anime cons. This episode seems to use that as a plot point, not unlike other series. Are the writers even aware that the same fans consume this? Do these fans know everything? Well, maybe the ones who swindled Tina. But not all of them. This scene can be viewed as a criticism of the knowledgeable fan, or as a warning about fandom literacy. Tina knows much about the show, but comparably little about the fandom attached to it, and here that allows her to break the ice, but also fall prey to the schemes of the same type of "dark fan" that convention legend speaks of. Her literacy extends only so far, and it leads her astray. Honestly, I can't really judge the intent here, nor should I. Ambiguity is part of the convention experience, especially for the first-timer, and can go either way: the fan will learn the cultural references and thrive, or miss them entirely and lose interest. Or even something else. It's that tricky, especially if the fan is going to the con alone. “Girls who watch the show are just girls. 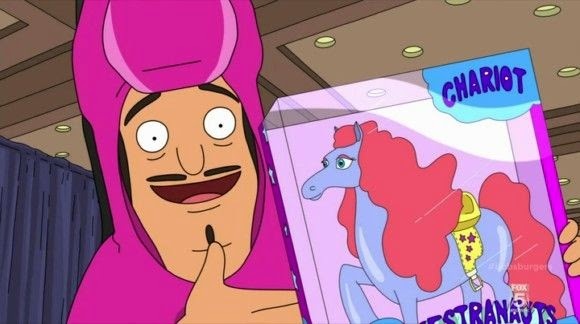 But you’re a man, so use your pony name.” Both offensive, and strangely spot on for a zing. Maybe it's because I'm an aware fan (and a brony, which sometimes requires a good deal of awareness), but moments like this both make me chuckle, and scare me, because the outsider perspective of fandom is the core of my own awareness. I don't publicly advertise my enjoyment of MLP beyond a purely "academic" sense, and for years I called myself a "professional weeaboo" because labeling myself any type/iteration of "otaku" made me feel highly uncomfortable. It still does, in certain instances, but where does the line between awareness and paranoia fall? Emotions can be just as ambiguous as embedded references, only the indicators and consequences are just as hazy. So the fan either must become hyper-aware, or something else, which in turn colors the fandom experience for both that fan, and his network of other fans. Just thinking about that makes my head spin sometimes, because I am deeply ingrained in my own thoughts and experiences, and forget that a good chunk of them are the result of hyper-awareness, or fear of both my fellow fan, and the outside world's perception of my fandom. Which, when you really think about it, is counterproductive to both fandom and the motivations by which fandom operates. It's adding a bit of poison into something safe, because a voice inside my our own heads seeks to pass judgement over ourselves. I wonder what Matoi Ryuko would think about that? Don't lose your way indeed. Bronconius is the perfect archetype of the domineering fan that doesn’t really exist. Yes, fans have met (and dealt with) his “type” before, but the way in which this character acts and interacts is more mythical than actual. You see them at cons, but rarely so perfectly formed and executed. This character is an amalgamation of these types, sort of the reverse ideal: if the ideal convention is where a fan can enjoy their fandom together with other fans, then this character is the ideal of the fans who want to block other fans in their own fandom, through means of “gatekeeping” and elitist activities that purposely limit the ability of any fans not already in a ‘club’ (new, female, whatever) to fully enjoy the fandom experience. It's toxic to have this element exist, but also toxic to pretend it doesn't exist. And, much like other aspects of fandom, it's the awareness of the problem that is the key. Ignorance, in this case, is not bliss, as the other fans realize at the end of the episode. By allowing their distaste to finally lead to the excision of the toxic member, they can find some of the harmony that Tina espouses in her speech.